This article is Part I of a review of three perspectives on stem cell transplantation onto a substantial size of infarcted myocardium to generate cardiogenesis in tissue that is composed of both repair fibroblasts and cardiomyocytes, after essentially nontransmural myocardial infarct. Cell-based therapy for myocardial infarction (MI) holds great promise; however, the ideal cell type and delivery system have not been established. Obstacles in the field are the massive cell death after direct injection and the small percentage of surviving cells differentiating into cardiomyocytes. To overcome these challenges we designed a novel study to deliver cardiac progenitor cells as a cell sheet. Cell sheets composed of rat or human cardiac progenitor cells (cardiospheres), and cardiac stromal cells were transplanted onto the infarcted myocardium after coronary artery ligation in rats. Three weeks later, transplanted cells survived, proliferated, and differentiated into cardiomyocytes (14.6 ± 4.7%). Cell sheet transplantation suppressed cardiac wall thinning and increased capillary density (194 ± 20 vs. 97 ± 24 per mm2, P < 0.05) compared with the untreated MI. Cell migration from the sheet was observed along the necrotic trails within the infarcted area. 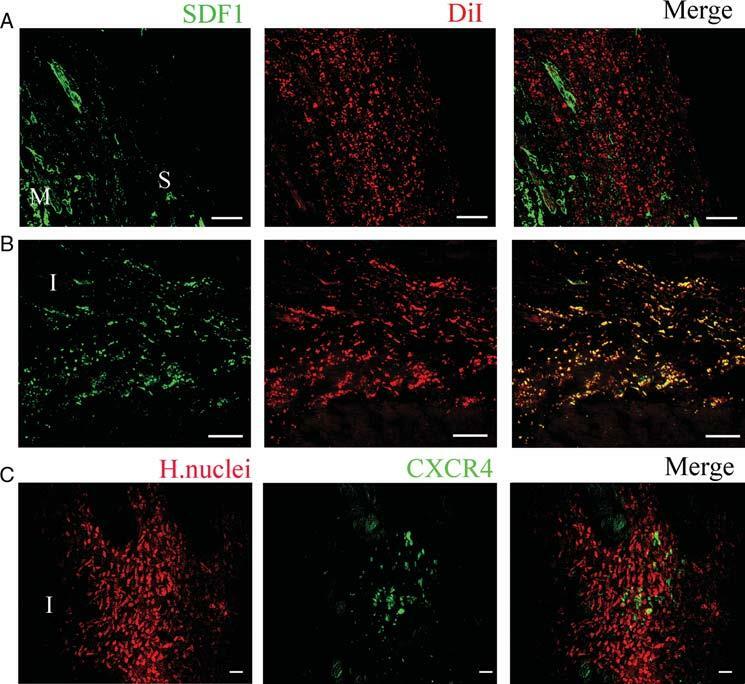 The migrated cells were located in the vicinity of stromal-derived factor (SDF-1) released from the injured myocardium, and about 20% of these cells expressed CXCR4, suggesting that the SDF-1/CXCR4 axis plays, at least, a role in cell migration. Transplantation of cell sheets resulted in a preservation of cardiac contractile function after MI, as was shown by a greater ejection fraction and lower left ventricular end diastolic pressure compared with untreated MI. Despite advances in cardiac treatment after myocardial infarction (MI), congestive heart failure remains the number one killer world-wide. MI results in an irreversible loss of functional cardiomyocytes followed by scar tissue formation. To date, heart transplant remains the gold standard for treatment of end-stage heart failure, a procedure which will always be limited by the availability of a donor heart. Hence, developing a new form of therapy is vital. To date, the most common technique for cell delivery is direct injection into the infarcted myocardium.12 This approach is inefficient because more than 90% of the delivered cells die by apoptosis and only a small number of the survived cells differentiated into cardiomyocytes.13 An alternative approach to cell delivery is a biodegradable scaffold-based engineered tissue.14,15 This approach has the clear advantage in creating tissue patches of different shapes and sizes and in creating a beating heart by decellularization technology.16 Advances are being made to overcome the issue of small patch thickness and to minimize possible toxicity of the degraded substances from the scaffold.15 Recently, scaffold-free cell sheets were created from fibroblasts, mesenchymal cells, or neonatal myocytes.17,18 Transplantation of these sheets resulted in a limited improvement in cardiac function due to induced neovascularization and angiogenesis through secretion of angiogenic factors.17–19 However, few of those progenitor cells have differentiated into cardiomyocytes.17 The need to improve cardiac contractile function suggests focusing on cells with higher potential to differentiate to cardiomyocytes with an improved delivery method. In the present study, we report a cell-based therapeutic strategy that surpasses limitation inherent in previously used methodologies. We have created a scaffold-free sheet composed of cardiac progenitor cells (cardiospheres) incorporated into a layer of cardiac stromal cells. The progenitor cells survived when transplanted as a cell sheet onto the infarcted area, improved cardiac contractile functions, and supported recovery of damaged myocardium by promoting not only vascularization but also a significant level of cardiomyogenesis. We also showed that cells from a sheet can be recruited to the site of injury driven, at least partially, by the stromal-derived factor (SDF-1) gradient. (4) MI treated with human sheet, n = 10. (2) 3-month-old SD rats (n = 10). Briefly, tissues were cut into 1–2 mm3 pieces and tissue fragments were cultured ‘as explants’ in a complete explants medium for 4 weeks (Supplementary Methods). one for transplantation and the other for characterization by immunostaining and RT–PCR (Supplementary Methods). spread off by adding media drops on the sheet (Figure 2A). Polycarbonate filter was used as a flexible mechanical support for cell sheet to facilitate handling during the transplantation. Immediately after LAD occlusion, the cell sheet was transplanted onto the infarcted area, allowed to adhere to the ventricle for 5–7 min, and the filter was removed before closing the chest (Figure 2A). Three weeks after MI, closed-chest in vivo cardiac function was measured using a Millar pressure conductance catheter system (Millar Instruments, Houston, TX) (Supplementary Methods). Rat host myocardium and cell sheet composition after transplantation were characterized by immunostaining (Supplementary Methods). Rat-originated cells were traced by DiI, while human-originated cells were identified by immunostaining with anti-human nuclei or human lamin antibodies. 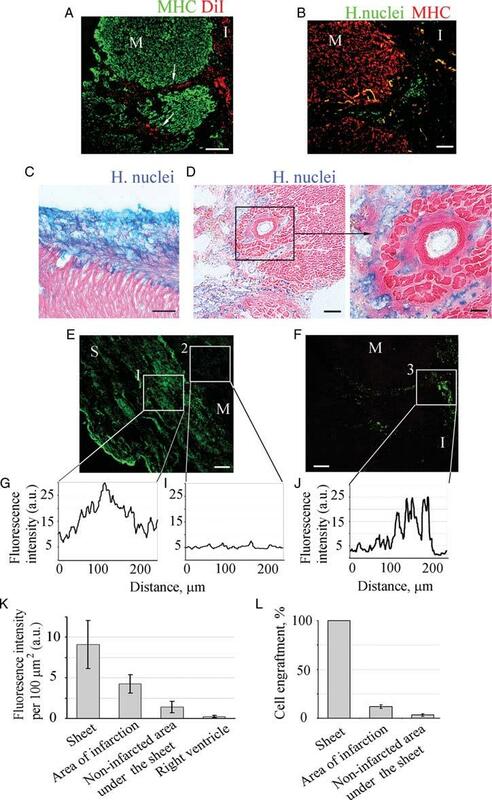 To assess sheet-originated cardiomyocytes within the host myocardium, the number of cells positive for both human nuclei and myosin heavy chain (MHC) (human sheet); or both DiI and MHC (rat sheet) were counted. To assess sheet-originated capillaries within the rat host myocardium, the number of cells positive for both human nuclei and von Willebrand factor (vWf) (human sheet); or both DiI and vWf (rat sheet) were counted. Cells were counted in five microscopic fields within cell sheet and area of infarct (n = 5). The number of cells expressing specific markers was normalized to the total number of cells determined by 40,6-diamidino-2-phenylindole staining of the nuclei DNA. To assess the survival of transplanted cells, sections were stained with Ki-67 antibody followed by fluorescent detection and caspase 3 primary antibodies followed by DAB detection (Supplementary Methods). To evaluate human sheet engraftment, sections were stained with human lamin antibody followed by fluorescent detection (Supplementary Methods). Rat host inflammatory response to the transplanted human cell sheet 21 days after transplantation was evaluated by counting tissue mononuclear phagocytes and neutrophils (Supplementary Methods). Images were captured using Olympus IX70 confocal microscope (Olympus Corp, Tokyo, Japan) equipped with argon and krypton lasers or Olympus IX-51 epifluorescence microscope using excitation/emission maximum filters: 490/520 nm, 570 /595 nm, and 355 /465 nm. Images were processed using DP2-BSW software (Olympus Corp). All data are represented as mean ± SE Significance (P < 0.05) was deter-mined using ANOVA (StatView). Cardiospheres were generated from atrial tissue explants. After 7–14 days in culture, a layer of stromal cells arose from the attached explants (Supplementary material online, Figure S2a). CFCs, small phase-bright single cells, emerged from explants and bedded down on the stromal cell layer (Supplementary material online, Figure S2b). After 4 weeks, single CFCs, as well as cardiospheres (spherical colonies generated from CFCs) were observed (Supplementary material online, Figure S2c). 22 and 28% of cells expressed a, b-MHC and cardiac troponin I, respectively. both are mesenchymal cell markers (Supplementary material online, Figure S3a and b). Less then 5% of cells were positive for endothelial cell marker; vWf. Cell characteristics of human cardiospheres are similar to those from rat tissues (Supplementary material online, Figure S3c). c-Kit2 cells strongly expressed KDR and GATA4, but were negative for Nkx2.5. vWfþ endothelial cells (10%) (Figure 1D and E). 15% of the sheet-forming cells were c-Kitþ suggesting the cells multipotency (Figure 1E). Cells within the sheet expressed gap-junction protein C43, an indicator of electromechanical coupling between cells (Figure 1D). 40% of cells were positive for the proliferation marker Ki-67 suggesting an active cell cycle state (Figure 1D, middle panel). No expression of Isl1 was detected in human sheet (Figure 1F). Figure 1 Cell sheet characteristics. (A) Fully formed cell sheet. Arrow indicates integrated cardiosphere. (B) H&E staining; pink colour (arrowhead) indicates cytosol and blue (arrows) indicates nuclear stain. Note that there is no necrotic core within the cell sheet. (C) Masson’s Trichrome staining of sheet section. Arrowhead indicates collagen deposition within the sheet. (D and E) Sheet sections were labelled with antibodies against following markers: (D) vWf (green), Ki-67 (green), C43 (green); (E) c-Kit (green), MHC (red), SMA (red) as indicated on top of each panel. Nuclei were labelled with blue fluorescence of 40,6-diamidino-2-phenylindole (DAPI). (F) Gene expression analysis of the cell sheet. Scale bars, 200 pm (A) or 50 pm (B–E). Two approaches were used to track transplanted cells in the host myocardium. rat cell sheets were labelled with red fluorescent dye, DiI, prior to the transplantation. the sheet created from human cells (human sheet) were identified in rat host myocardium by immunostaining with human nuclei antibodies. DiI-labelling together with trichrome staining showed engraftment of the cardiosphere-derived cell sheet to the infarcted myocardium (Figure 2B–D). In vivo sheets grew into a stratum with heterogeneous thickness ranging from 0.1–0.5 mm over native tissue. The percentage of Ki-67þ cells within the sheet was 37.5 ± 6.5 (Figure 2F) whereas host tissue was mostly negative (except for the vasculature). To assess the viability of transplanted cells, the heart sections were stained with the apoptosis marker, caspase 3. A low level of caspase 3 was detected within the sheet, suggesting that the majority of transplanted cells survived after transplantation (Figure 2G). Figure 2 Transplantation and growth of cell sheet after transplantation. (D) LV section of untreated MI rat at day 21 showing no significant red fluorescence background. Bottom row (B–D) demonstrates the enlargement of box-selected area of corresponding top panels. (E) Similar sections stained with Masson’s Trichrome. Section of rat (F) or human (G) sheet treated rat at day 21 after MI. (F) Section was stained with antibody against Ki-67 (green). Cell sheet was pre-labelled with DiI (red). Nuclei stained with blue fluorescence of DAPI. (G) Section was double stained with human nuclei (blue) and caspase 3 (brown, arrows) antibodies and counterstained with eosin. Asterisks (**) indicate cell sheet area. Scale bars 200 mm (B–D, top row), 100 mm (B–D, bottom row, and E) or 50 mm (F, G). Twenty-one days after transplantation of human cell sheet, inflammatory response of rat host was examined. Transplantation of human sheet on infarcted rats reduced the number of mononuclear phagocytes (ED1-like positive cells) compared with untreated MI control (Supplementary material online, Figure S4a–e and l). In addition, the number of neutrophils was similar in both control untreated MI and sheet-treated sections (Supplementary material online, Figure S4f–k and m). These data suggest that at 21 days post transplantation, human cell sheet was not associated with significant infiltration of host immune cells. Development of new vasculature was determined in cardiac tissue sections by co-localization of DiI labelling and vWf staining (Figure 3C). 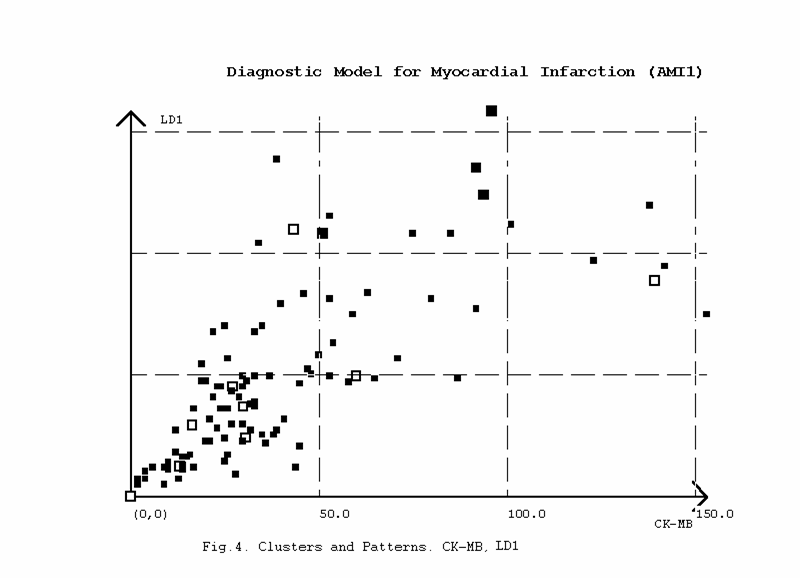 Three weeks after transplantation, the capillary density of ischaemic myocardium in the sheet-treated group significantly increased compared with MI animals (194 ± 20 vs. 97 ± 24 per mm2, P < 0.05, Figure 3A and B). The capillaries originated from the sheet ranged in diameter from 10 to 40 jim (n 1/4 30). A gradient in capillary density was observed with higher density in the sheet area which was decreased towards underlying infarcted myocardium. Mature blood vessels were identified within the sheet area and in the underlying myocardium in close proximity to the sheet evident by vWf and SMA double staining (Figure 3D). Figure 3 Neovascularization of infarcted wall. (A) Frozen tissue sections stained with vWf antibody (green). LV section of control (sham), infarcted (MI), and MI treated with cell sheet (sheet) rats. Scale bar, 100 jim. (B) Capillary density decreased in the MI compared with sham (*P < 0.05) and improved after cell sheet treatment (#P < 0.05). (C) Neovascularization within cell sheet area was recognized by co-localization of DiI- (red) and vWf (green) staining. Scale bar 100 jim. (D) Mature blood vessels (arrows) were identified by co-localization of SMA (red) and vWf (green) staining. Scale bar 50 jim. the area where the cell migrated from the sheet to the infarcted myocardium had higher signal intensity (47%, or 11.9 ± 1.7% of total number of cells), indicating a higher number of sheet-originated cells are engrafted in the infarcted area.) (Figure 4K and L). Migrated cells were positive for KDR (Supplementary material online, Figure S5). Figure 4 Engraftment quantification of cells migrated from the sheet into the infarcted area of MI. Animals were treated with rat (A) or human (B–F) sheets. Cardiomyocytes were labelled with MHC antibody (A, green or B, red). Rat sheet-originated cells were identified with DiI-labelling, red (A). Arrows indicate the track of migrating cells. Human sheet-originated cells were identified by immunostaining with human nuclei antibody followed by secondary antibodies conjugated with either Alexa 488 (B, E and F, green) or AP (C, D, blue). No migration was detected when the cell sheet was transplanted onto non-infarcted myocardium (C). Heart sections were counterstained with eosin, pink (C–D). Higher magnification of area selected in the box is presented (D, right). Immunofluorescence of sheet (green) grafted to the myocardium surface (E) or cells migrated to the infarction area (F). Fluorescence profiles acrossthe cell sheet itself(G, box 1), area underlying cell sheet (I, box 2) and infarction areawith migrated cells (F, box 3). Mean fluorescence intensityofthe grafted human (K) cells was determined by outlining the region of interest (ROI) and subtracting the background fluorescence for the same region. Fluorescence intensity was normalized to the area of ROI (ii 1/4 6). (L) Percent engraftment was defined as number of lamin-positive cells divided by total number of cells per ROI. ‘M’, myocardium,’S’ sheet, ‘I’ infarction. Scale bars 100 mm (A–C, D, left, E and F), or 50 mm (D, right). To elucidate a possible mechanism of cell migration, sections were stained to detect SDF1 and its unique receptor CXCR4. The migration patterns of cells from the sheet coincided with SDF-1 expression. Within 3 days after MI, SDF-1 was expressed in the injured myocardium (Figure 5A). At 3 weeks after MI and sheet transplantation, SDF-1 was co-localized with the migrated labelled cells (Figure 5B). PCR analysis revealed CXCR4 expression in cell sheet before transplantation (Figure 1F). However, after transplantation only a fraction of migrated cells expressed CXCR4 (Figure 5C). Figure 5 Migration of sheet-originated cells into the infarcted area. Confocal images of MI animals treated with sheets from rats (A and B) or human (C). SDF1 (green) was detected at border zone of the infarct at day 3 (A) and day 21 (B). Rat sheet-originated cells were identified with DiI-labelling (red). Note co-localization of DiI-positive sheet-originated cells with SDF1 at 21 days after MI (B). Human cells were identified by immunostaining with human nuclei antibody, red, (C). Note human cells that migrated to the area of infarct express CXCR4 (green) (C). Scale bar, 200 mm (A, B) or 50 mm (C). ‘M’, myocardium, ‘S’ sheet, ‘I’ infarct. 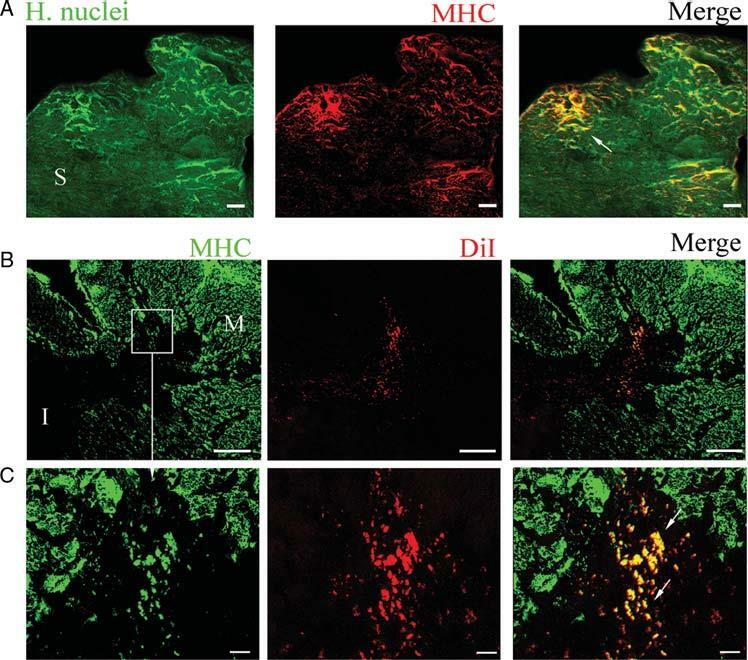 The differentiation of migrating cells into cardiomyocytes was evident by the co-localization of MHC staining with either human nuclei (Figure 6A) or DiI (Figure 6B and C). In contrast to the immature cardiomyocyte-like cells within the pre-transplanted cell sheet, the migrated and newly differentiated cells within the myocardium were about 30–50 mm in size and co-expressed C43 (see Supplementary material online, Figure S6). Cardiomyogenesis within the infarcted myocardium was observed in the sheets created from either rat or human cells. Figure 6 Cardiac regeneration. Sections of MI animals treated with human (A) or rat (B, C) sheets. Human sheet was identified by immunostaining with human nuclei antibody (green). Section was double-stained with MHC (red) antibody. Newly formed cardiomyocytes was identified by co-localization of human nuclei and MHC (yellow, arrow). (B) Rat sheet-originated cells were identified by DiI labelling (red). Section was double-stained with MHC (green) antibody. Newly formed cardiomyocytes were detected by co-localization of DiI with MHC (yellow, arrows). 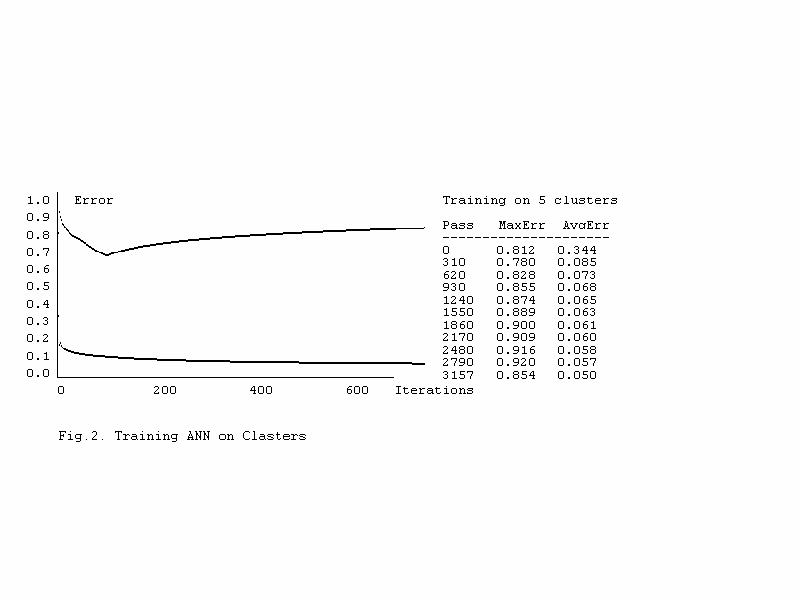 (C) Higher magnification of area selected in the boxes (B). Scale bars 200 mm (B), or 20 mm (A, C). ‘M’, myocardium, ‘S’ sheet, ‘I’ infarct. Closed-chest in vivo cardiac function was derived from left ventricle (LV) pressure–volume loops (PV loops), which were measured using a solid-state Millar conductance catheter system. MI resulted in a characteristic decline in LV systolic parameters and an increase in diastolic parameters (Table 1). Cell sheet treatment improved both systolic and diastolic parameters (Table 1). 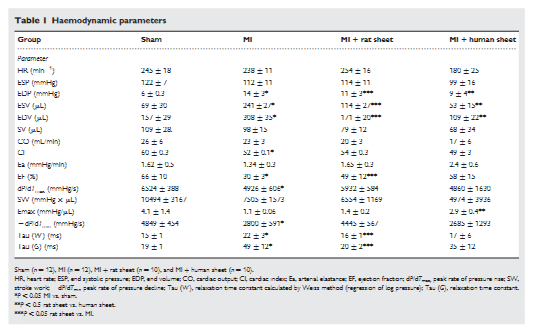 Specifically, load-dependent parameters of systolic function: ejection fraction (EF), dP/dTmax, and cardiac index (CI) were decreased in MI rats and increased towards sham control with the cell sheet treatment (Table 1). Diastolic function parameters, dP/dTmin, relaxation constant (Tau), EDV, and EDP were increased in the MI rats and returned towards sham control parameters after sheet treatment (Table 1). However, load-independent systolic function, Emax, was decreased after MI. Treatment with human sheet improved Emax, while treatment with rat sheet had no effect (Table 1). Treatment with either rat or human sheets retarded LV remodelling; as such that it increased the ratio of anteriolateral wall thickness/LV inner diameter (t/Di) and wall thickness/LV outer diameter (t/Do) (see Supplementary material online, Table S3). However, human sheets appear to further improve LV remodelling compared with rat sheets as indicated by increased ratio of wall thickness to ventricular diameter and decreased both EDV and EDP (Table 1 and see Supplementary material online, Table S3). The majority of the cardiac progenitor cells delivered using our scaffold-free cell sheet survived after transplantation onto the infarcted heart. A significant percentage of transplanted cells migrated from the cell sheet to the site of infarction and differentiated into car-diomyocytes and vasculature leading to improving cardiac contractile function and retarding LV remodelling. 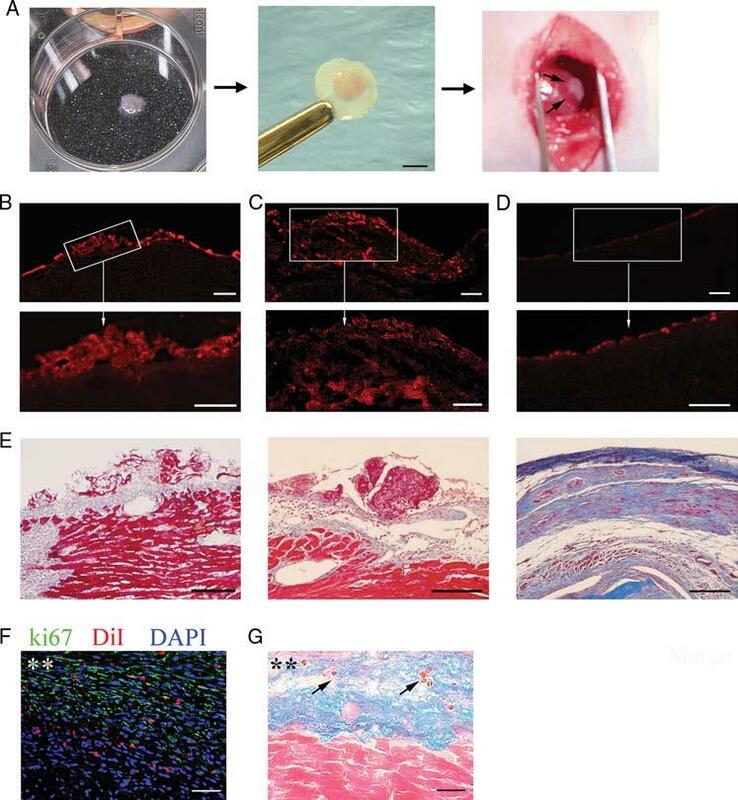 Thus, delivery of cardiac progenitor cells together with cardiac mesenchymal cells in a form of scaffold-free cell sheet is an effective approach for cardiac regeneration after MI. In the present study, delivery of cardiac progenitor cells as a cell sheet facilitates cell survival after transplantation. Necrotic cores, commonly observed in tissue engineered patches,23,24 are absent in cardiosphere sheets prior to transplantation (Figure 1B and C). Poor cell survival is caused by multiple processes such as: ischemia from the lack of vasculature and anoikis due to cell detachment from sub-strate.25 A possible mechanism of cell survival within the sheet is the induction of neo-vessels soon after transplantation due to the presence of endothelial cells within the sheet before transplantation (Figure 10). The cell sheet continued to grow in vivo (Figure 2B and C), suppressed cardiac wall thinning, and prevented LV remodelling at 21 days after transplantation (see Supplementary material online, Table S3). This maybe due to the induction of neovascularization (Figure 3), which may prevents ischemia-induced cell death (Figure 2G). Another likely mechanism of cell survival is that the cells within the scaffold-free sheet maintained cell-to-cell adhesion16 as shown by ICAM expression (Figure 1F). The cells also exhibit C43-positive junctions (Figure 10, see Supplementary material online, Figure S6), which may facilitate electromechanical coupling between the transplanted cells and the native myocardium. We observed cell migration from the sheet to the infarcted myocardium (Figure 4A and B, E and F), which may be facilitated by the strong expression of MMP2 in the cell sheet (Figure 1F). Although, the mechanism of cardiac progenitor cell migration remains unclear, previous observations showed that SDF-1 is upregulated after MI and plays a role in bone-marrow and cardiac stem cell migration.26,27 Our data suggest that SDF-1-CXCR4 axis plays, at least in part, a role in cardiac progenitor cell migration from cell sheet to the infarcted myocardium. This conclusion is based on the following observations: (1) cell sheet expresses CXCR4 prior to transplantation (Figure 1F), (2) migrated cells are located in the vicinity of SDF-1 release (Figure 5A and B), and (3) about 20% of migrated cells expressed CXCR4. Note, not all the migrated cells expressed CXCR4 suggesting other mechanisms are involved in cell migration (Figure 5C). Here we report that implanting cardiosphere-generated cell sheet onto infarcted myocardium not only improved vascularization but also promoted cardiogenesis within the infarcted area (Figure 6). A larger number of newly formed cardiomyocytes were found deep within the infarct compared with the cell sheet periphery. Notably the transplantation of the cell sheet resulted in a significant improvement of the cardiac contractile function after MI, as was shown by an increase of EF and decrease of LV end diastolic pressure (Table 1). The beneficial effect of cell sheet is, in part, due to the presence of a large number of activated cardiac mesenchymal stromal cells (myofibroblasts) within the sheet. Myofibroblasts are known to provide a mechanical support for grafted cells, facilitating contraction28 and to induce neovascularization through the release of cytokines.17 In addition, mesenchymal cells are uniquely immunotolerant. In xenograft models unmatched mesenchymal cells transplanted to the heart of immunocompetent rats were shown to suppress host immune response29 presumably due to inhibition of T-cell activation.30 Consistently with previous study from our laboratory,31 here, we demonstrated host tolerance to the cell sheet 21 days after MI. Finally, phase II and III clinical trials are currently undergoing in which allogeneic MSCs are used to treat MI in patients (Osiris Therapeutic, Inc.). In summary, our results show that cardiac progenitor cells can be delivered as a cell sheet, composed of a layer of cardiac stromal cells impregnated with cardiospheres. 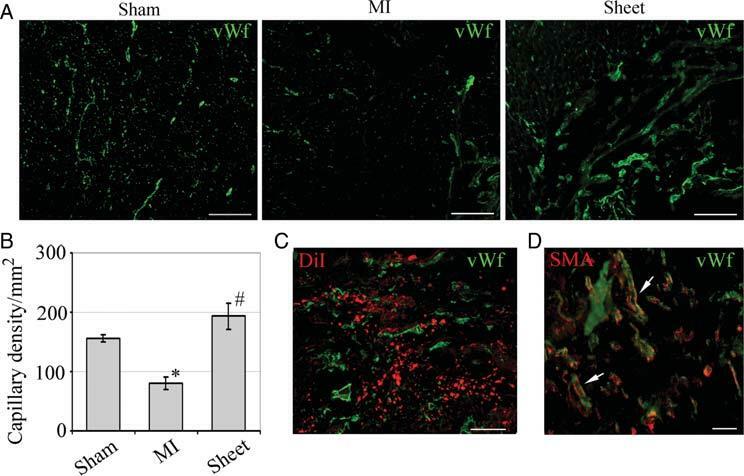 After transplantation, cells from the cell sheet migrated to the infarct, partially driven by SDF-1 gradient, and differentiated into cardiomyocytes and vasculature. Transplantation of cell sheet was associated with prevention of LV remodelling, reconstitution of cardiac mass, reversal of wall thinning, and significant improvement in cardiac contractile function after MI. Our data also suggest that strategies, which utilize undigested cells, intact cell–cell interactions, and combined cell types such as our scaffold-free cell sheet should be considered in designing effective cell therapy. Fuchs JR, Nasseri BA, Vacanti JP, Fauza DO. Postnatal myocardial augmentation with skeletal myoblast-based fetal tissue engineering. Surgery 2006;140:100–107. Orlic D, Kajstura J, Chimenti S, Bodine DM, Leri A, Anversa P. Bone marrow stem cells regenerate infarcted myocardium. Pediatr Transplant 2003;7(Suppl. 3):86–88. Kawamoto A, Tkebuchava T, Yamaguchi J, Nishimura H, Yoon YS, Milliken C et al. Intramyocardial transplantation of autologous endothelial progenitor cells for therapeutic neovascularization of myocardial ischemia. Circulation 2003;107:461–468. Iwasaki H, Kawamoto A, Ishikawa M, Oyamada A, Nakamori S, Nishimura H et al. Dose-dependent contribution of CD34-positive cell transplantation to concurrent vasculogenesis and cardiomyogenesis for functional regenerative recovery after myocardial infarction. Circulation 2006;113:1311–1325. Beltrami AP, Barlucchi L, Torella D, Baker M, Limana F, Chimenti S et al. Adult cardiac stem cells are multipotent and support myocardial regeneration. Cell 2003;114: 763–776. Oh H, Bradfute SB, Gallardo TD, Nakamura T, Gaussin V, Mishina Y et al. Cardiac progenitor cells from adult myocardium: homing, differentiation, and fusion after infarction. Proc Natl Acad Sci USA 2003;100:12313–12318. Laugwitz KL, Moretti A, Lam J, Gruber P, Chen Y, Woodard S et al. Postnatal isl1+ cardioblasts enter fully differentiated cardiomyocyte lineages. Nature 2005;433: 647–653. Pfister O, Mouquet F, Jain M, Summer R, Helmes M, Fine A et al. CD31- but Not CD31+ cardiac side population cells exhibit functional cardiomyogenic differentiation. Circ Res 2005;97:52–61. Dawn B, Stein AB, Urbanek K, Rota M, Whang B, Rastaldo R et al. Cardiac stem cells delivered intravascularly traverse the vessel barrier, regenerate infarcted myocardium, and improve cardiac function. Proc Natl Acad Sci USA 2005;102:3766–3771.